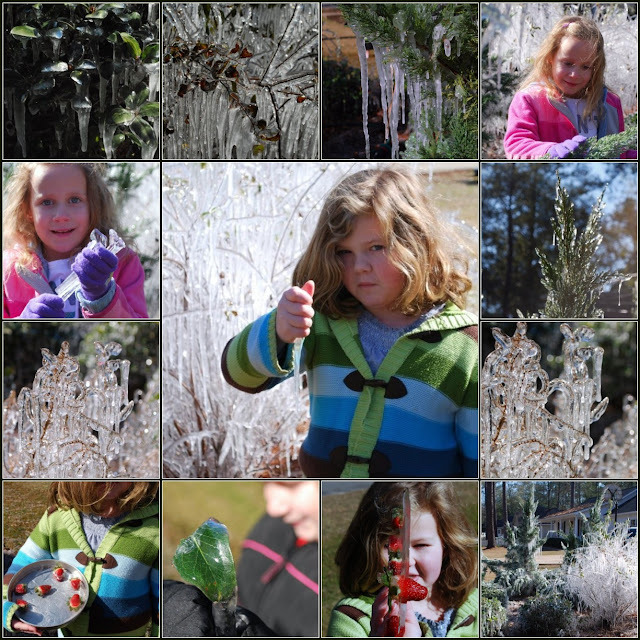 It may not be snowing in South GA but we had fun with the cold weather. ritual, threw in a load of laundry, got pissed at the kids, fed the dogs that kind of immediately. that we were about to trample their yard to death) it was still in it's full icy cold glory. along and capture the beauty and color.... and so it did. and I tell you I think I'm gonna like playing with that.... so simple!!!! p.s. the frozen strawberries were a little science project from our lovely little girl next door. Oh oh oh and I LOVE your icy wintery wondery shots! very very cool! You kinda are a nerd, but I don't hold that against you, and thanks for pumping up my comments!!! hee hee. Hey, I thought I was the nerd here? Is it just me or does she look like she might stab something in that picture? Or is that just because I watched Paranormal Activity? Not a nerd is my vote! I wrote a story in high school about a guy who murders his wife with an icicle and then there was no murder weapon. Love the pictures. Those girls are so cute. Two of my followers are icicle murderers... Bambi... I need some icicle repellent to go with the axe repellent please... I have a spell check for axe?? do you spell it ax in the States??? now that's just wrong!! Very cute pics, they look very wintery even without the snow! Great pics. I'm glad its not that cold where i live. We have sandball fights instead of snowball.